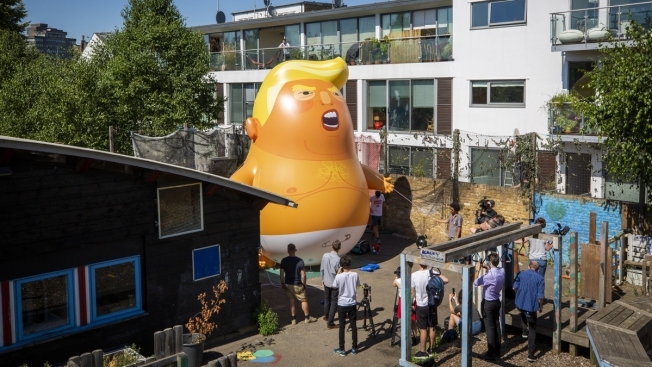 "We want to make sure he knows that all of Britain is looking down on him and laughing at him"
An inflatable balloon of a baby with Donald Trump's face is seen on its first London outing inside a disused playground on June 26, 2018. Its creator won approval to fly it above Parliament Square in Westminster when President Trump arrives in the United Kingdom on July 13. When President Donald Trump goes to London next week, he'll be greeted by a 20-foot-tall orange baby with his own face floating over Parliament, NBC News reported. It's one of many protests planned for Trump's first visit to the United Kingdom since taking office; a grander official state visit appears to be on ice after at least 1.9 million Brits signed a petition opposing it. Trump's July 13 visit to the U.K. will include talks with Prime Minister Theresa May, a meeting with the queen and possibly some golf at one of his Scottish resorts. On Thursday, Leo Murray won permission to fly the crowdsourced, helium-filled Trump blimp, having said that ridicule is an effective form of protest against the president: "we want to make sure he knows that all of Britain is looking down on him and laughing at him." Frank Lesser inflates a Trump chicken at his New York apartment.